Clancy and I have met so many wonderful people together just by being out through our various activities. Clancy brings so much joy to everyone that crosses his path and has many fans who would like to see more of him. Since we do go to so many places and do so many things together (in various States, too! ), there will be a new category of the blog dedicated to the Clancy fans! 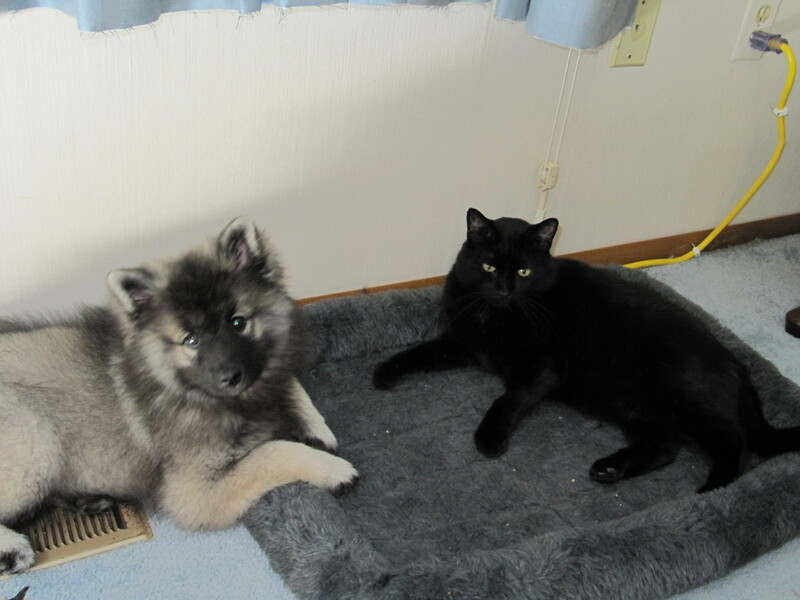 (Look for the category “Clancy – My Keeshond” for just fun Clancy updates, pics and videos.) NEW: Clancy has his own Facebook Page! 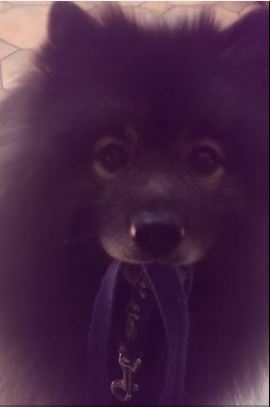 Follow Clancy’s adventures, see him do tricks on #TrickTuesday and cute retro pics of Clancy on #ThrowbackThursday by “Liking” Clancy, the fluffy trick dog – Keeshond on Facebook! So, here’s Clancy! The UKC Altered Champion, Rally Obedience level 3, United Junior Jumper (1st UKC dock diving titled Keeshond), AKC Companion Dog Excellent, Rally Advanced Excellent, Dock Junior (1st AKC dock diving titled Keeshond), Advanced Canine Good Citizen, AKC Therapy Dog titled, Ultimate Air Dogs AND North American Diving Dogs Dock Junior titled, and the first CHAMPION Trick Dog titled Keeshond! *More training for other titles are always in progress! Hello! Do you remember Kees Of Dog’s Delight? Yes, I’m ashamed I have let a year and a half go by since I’ve updated my blog that Clancy motivated me to start years and years and years ago. As always, Clancy and I have been busy getting out there and having fun in between my work to pay the bills for us to be able to do all that we do, and have a roof over our heads. I don’t even know where to begin to catch up on things… and I’m not even going to attempt to try to start remembering the sequence of events from last February to now. So, when I can, I will just post something interesting that has happened or something that I hope motivates all you dog lovers to do something a little special with your fur-kids. There is one big piece of news, well, two big pieces of news to bring you up to speed on. Clancy is no longer an “only child”. He shares his fun life with two “little brothers”! Again, long stories for another time, but we will soon formally introduce “Silver” (a rescued Kees, about 3 years old now) and “Monty” (my first show puppy, now about 18 months old). 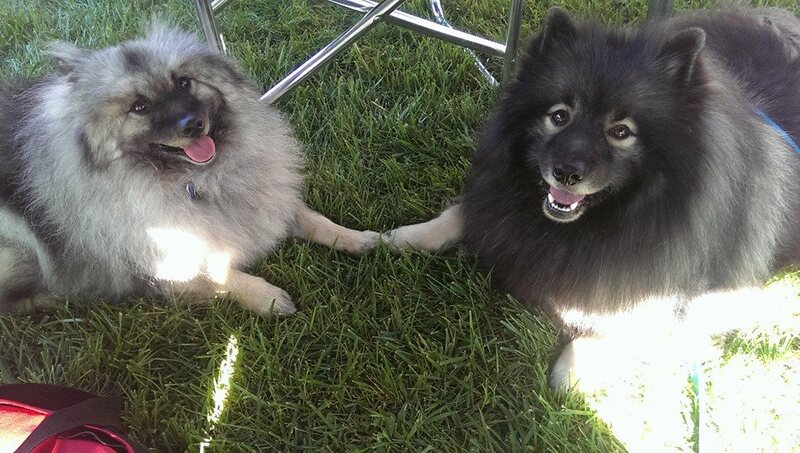 They are all good friends and though Clancy still definitely values his “one-on-one” time with me, he enjoys the company of his Keeshond companions. Here’s a pic of the “three amigos” in early June 2018 after attending (and earning many ribbons, placements and accomplishments) at the 2018 Keeshond Club of America National Specialty show in Lawrence, Kansas. Clancy in the Big Apple! New York has gone to the dogs! Well, just until tonight when the Westminster Kennel Club dog show concludes. 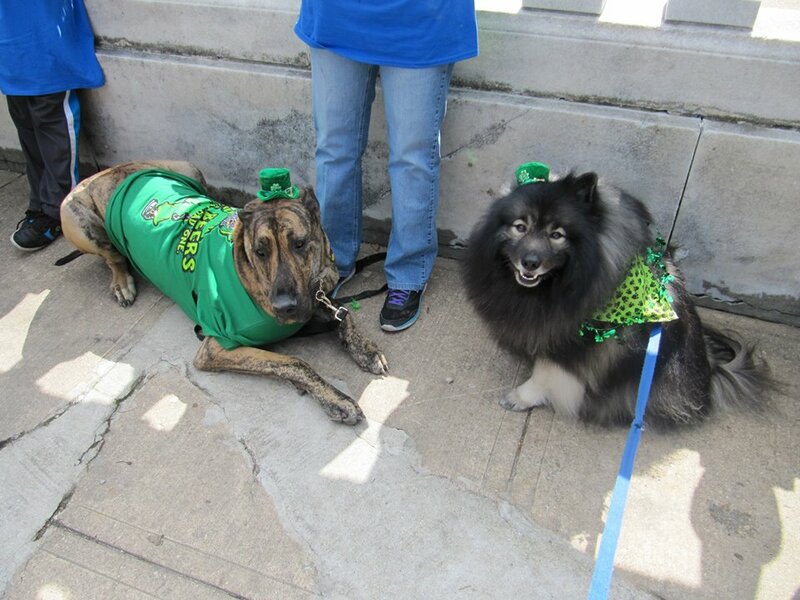 This past weekend, Clancy and I volunteered to help introduce Keeshonden to hundreds, maybe thousands, of people who went to the “AKC Meet and Compete” event at Pier 92 in New York City.. Oh what a fun event for animal lovers! It is part of the Westminster Kennel Club dog show festivities leading up to what many would consider to be the most highly regarded dog show in the country. Each AKC recognized dog breed has a booth where the public can “Meet the Breed” and ask questions to the knowledgeable volunteers that are passionate about the dogs (and cats… yes all the cat breeds were there!) they love. Clancy making friends with a giant Beagle at the Meet the Breed event. As Keeshond owners likely know, you can’t make it far in public with your Kees without being stopped by people in awe. “What kind of dog iiiis that?! ?” (Us Kees lovers don’t mind at all… we can never get tired of talking about how awesome our dogs are!) It began for Clancy and I about 3 blocks from the piers in Manhattan. We finally made it to the Keeshond Meet The Breed booth to help give other volunteers and their dogs a break from the adoring public. So so so many people were there, despite a recent snowstorm in the city! The AKC must have done a great job marketing the event. Though we had little time to talk to each other, it was great being with other Keeshond lovers behind the booth. If you have a good representative of a pure-bred dog that loves people and is conditioned for a crowded high-energy crazy environment, I highly recommend reaching out to your breed’s parent club and asking if you can take part in a Meet the Breed event. It is rewarding to educate so many about the wonderful (and not so wonderful) qualities of the breed that captured your heart so those considering getting a dog, may make an informed decision on what breed is right for them. We spent much of the day at our booth, and unfortunately, the weather was really crumby the next day, so Clancy and I didn’t get to do much in New York City this time. My Smiling Dutchman on Pier 92. He was really exhausted after the day’s activities anyway. We do look forward to returning next year to do it again and hopefully have some fun together in the city. Have fun watching Westminster and cheering on your favorite breed! Also, be sure to let the champion of your heart know how much he/she is loved today! Happy Valentine’s Day! 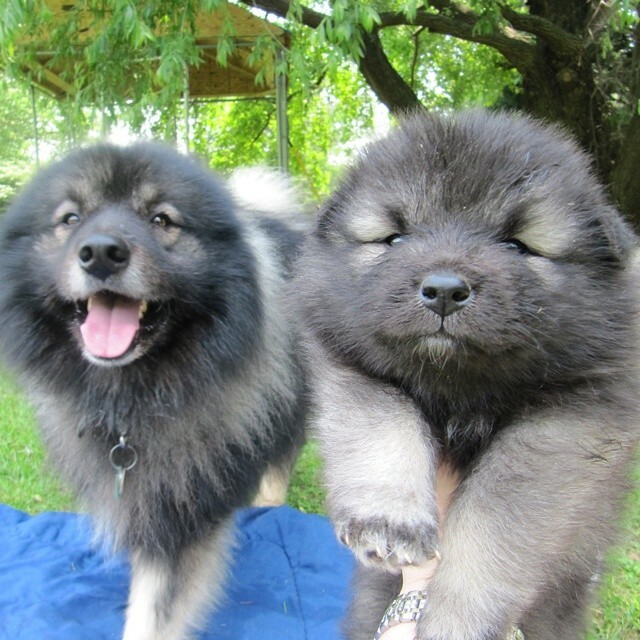 Categories Keeshond stuff, Uncategorized, Videos starring Clancy the Keeshond! 2016 has been an exciting year for Clancy! From our first real TV appearance, to qualifying for the RAE Class at the AKC Rally Nationals, achieving our Rally Advanced Excellent obedience title at the Keeshond Club of America National in Colorado, finishing as the top Keeshond in AKC Rally, to doing trick shows, creating lots of smiles through therapy dog visits, and having fun with dock diving, Clancy and I had a great 2016. We will share pics of how our year went soon. We’ve been so busy, so apologies for not being able to blog much this year. We’ll see what 2017 brings! For now, we’d like to wish everyone a happy, successful and healthy New Year! Enjoying your summer? Take your vacation yet? I’m working on a blog post about taking a road trip with you dog and need a couple more days to decide which of the hundreds of pictures I have should be included with it. For now, enjoy a few pics of Clancy celebrating 4th of July! Fluffy Dog, Clancy, acting out The Secret Life of Pets scene & C’mon back soon! Clancy and I tried to enter the “The Secret Life of Pets” live animal casting audition where you have your pet re-enact a scene from the movie trailer. Unfortunately, due to technical difficulties, our video submission wasn’t accepted. It’s still pretty cute, so please check it out below and enjoy! The month of June was all about catching up on work and other things after our Colorado trip, but I plan on writing some substantive blog posts soon, so please check back in the near future! 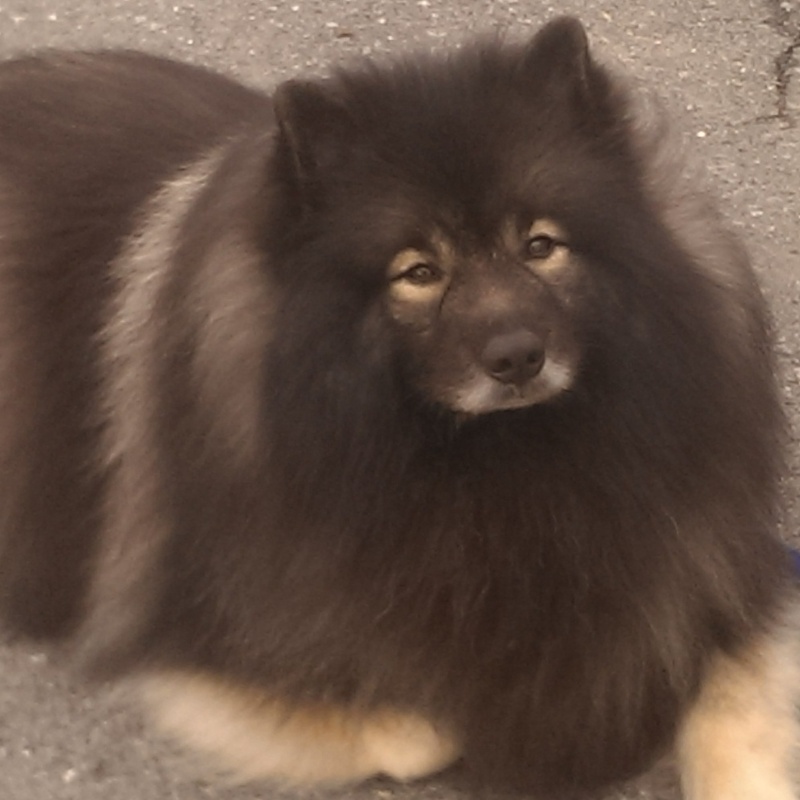 Categories Clancy ~ My Keeshond, Dog Tricks, Uncategorized, Videos starring Clancy the Keeshond! Where has May gone? To Colorado! When I get some time after I get home, I will share pics of this wonderful trip with my dog. If you ever get a chance to take a road trip to a pet-friendly destination like Colorado Springs with your dog, do it!!! It’s a wonderful bonding experience and you get to meet so many wonderful dog lovers along the way. We even got to stop to meet a Facebook friend in person along our travel route. I have many topics I can’t wait to blog about, so please check keep checking back periodically! Happy Birthday, Clancy, the Fluffy Trick Dog! HAPPY BIRTHDAY, Fancy Chief Clancy!!! So hard to believe that he is already 5 years old! Clancy has already brought so much fun and joy to thousands… (yes, thousands!) of people during the 5 years of his existence. We, and I hope you, look forward to the adventures, fun and joy yet to come for the next 10+ years. I’ve had the blessing of knowing Clancy since he was just 10 days old… when I met his breeder for the first time. I had the treasured opportunity of visiting him on almost a weekly basis as he grew up to be old enough to take home. Clancy and I have a lot of things coming up that we have been training for. We will be active on this blog again once things calm down. We have some big trials coming up and are hoping to achieve new titles in Obedience and in Rally before the end of May. In the meantime, please follow Clancy on his Facebook page to see regular updates including the fun pics/videos on #TrickTuesday and #ThrowbackThursday. 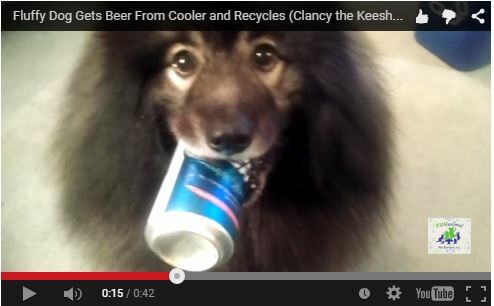 Clancy the Keeshond’s newest dog trick video. Enjoy and Happy Easter! A new trick Clancy is working on for Super Bowl Sunday… Hike the Football! Cute video! Ready for some Football! Clancy hikes ball dog trick – Move over Puppy Bowl! 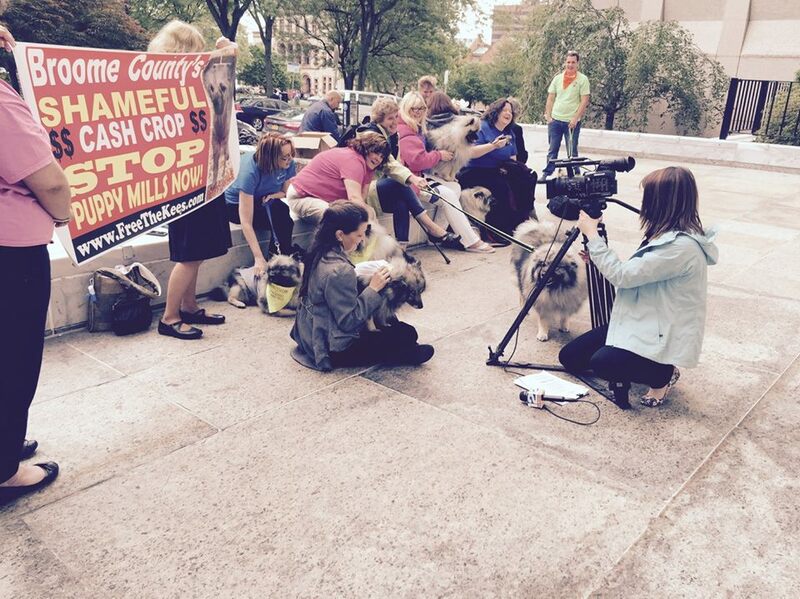 Here’s Clancy the Keeshond’s TV debut! 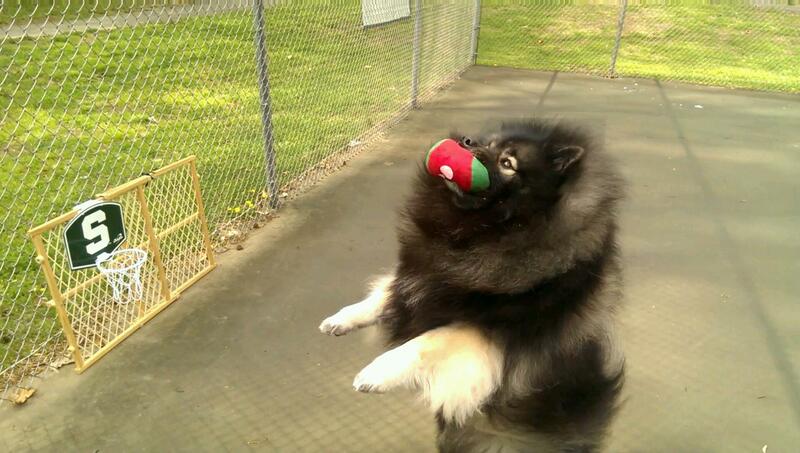 Clancy, the Keeshond, doing some Fluffy Dog Tricks in his TV debut! Please click on the link below to see Clancy’s segment on Good Morning Washington on WJLA ABC 7’s affiliate, News Channel 8. Clancy, sporting a Washington Capitals winter hat, tries to help clear away nearly 2 feet of snow. We are now booked to do a 3 – 5 minute segment on “Good Morning Washington” to demonstrate his snow shovel trick live along with a few other tricks. If you live in the DC area, set your DVR for News Channel 8 (WJLA 7 ABC news affiliate) for our 9:15 am segment on Thursday, Jan. 28. If you don’t live in the area, look for us online! Once the live segment airs, they will post to wjla.com within 1 to 3 business days. We love our Kees of Dogs Delight blog fan base and will continue to publish the variety of videos/photos/articles/announcements here. I recently created www.FluffyDogTricks.com for the ease of directing the numerous people that crosses Clancy’s path who would love to just see Clancy’s tricks. As Keeshond lovers know, it isn’t easy to explain the breed name… and it’s a lot easier for people to remember to look up Fluffy Dog Tricks instead. So, there you will find Clancy’s dog trick videos in one place and we’ll also post tricks in progress so you can see, as smart as Clancy is, teaching a new trick usually doesn’t happen overnight. (I do admit that it only took about 10 minutes to teach Clancy the “snow plow” trick seen below, but other tricks we’ve been working on for a long long time.) I look forward to writing that blog post on dog tricks that I promised! 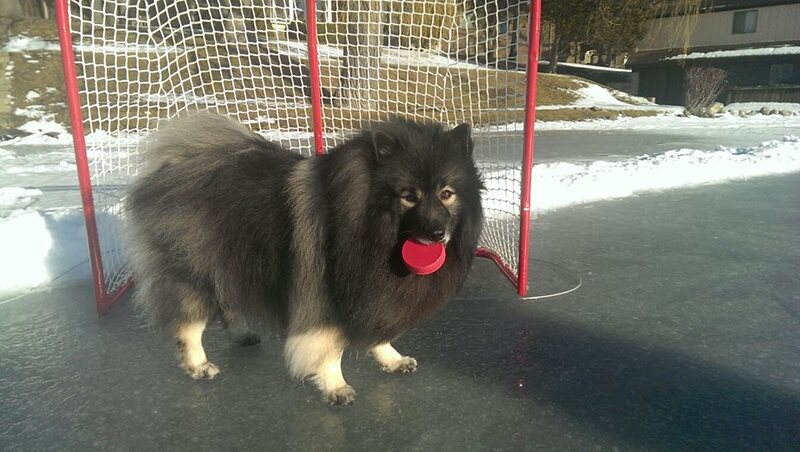 Clancy the Keeshond … the snow shoveling dog! In case you miss it, I’ll post the link to our segment on GMW next week. 🙂 Hope everyone is enjoying the snow with their dog! ~ Be Your Dog’s Best Friend ~ S.S.B. A Toast to 2015 and to 2016! Clancy and I wish you Happy New Year! As the saying goes, time flies when you’re having fun! We hope that you had some fun this past year with your dog(s) and pledge to keep having fun with ’em next year, too! As you may already know from reading our blog throughout the year, Clancy and I had a fun and successful 2015, and look forward to the adventures that 2016 brings. And Please Remember… a dog’s life is too short… try to do something memorable with them this coming year. Happy New Year! Please consider volunteering even a little bit of time with your wonderful pet as a pet therapy team. Therapy dog work is so rewarding and anyone with a social and well-behaved pet can become involved. There are a large variety of establishments that are in need of pet therapy to help calm nerves, help with a mental or physical disability, or to brighten up someone’s day. Many times, when Clancy and I do a therapy dog visit, we are not just brightening up someone’s day; we have been the one happy moment of that troubled person’s week, month, or sadly, the remainder of their life. It means so much to people to have their minds taken off of their troubles as your pet greets them, even if it’s just for a few minutes. Clancy cheering up a patient at the hospital, giving her a mental break from her pain. As much as people appreciate our visits, it’s just as rewarding to us. Watching people take joy in petting Clancy, the laughter his doggie kisses brings, and the applause he gets from delighting everyone with his trick performances, makes me and everyone who witnesses it feel good. Even those that don’t care for dogs, have to smile when Clancy waves at them or does another cute dog trick, like playing the “piano”. 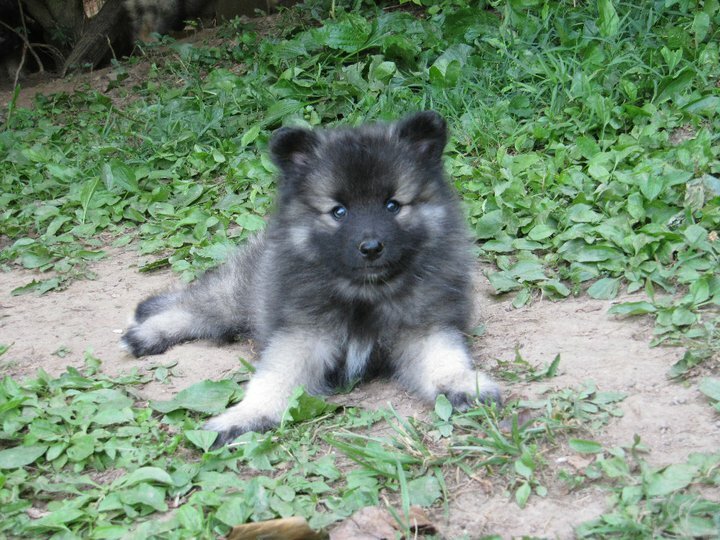 If you have a Keeshond, then you know that even just the mere sight of your fluff ball triggers smiles and gasps of awe. Clancy showing off his basketball trick to long-term patients in a hospital. Clancy and I volunteer with a local pet therapy program and have visited nursing homes, dementia care facilities, Hospices, elementary schools, colleges, hospitals, public libraries and more. Lonely elders are reminded of good times with their own pets which triggers them to have conversations with others long after you leave. Clancy giving some love at a nursing home. It’s especially special to get a reaction from someone that has been trapped in their own mental state, not acknowledging the outside world. Clancy did just that with an elderly lady at a special adult care live-in facility. As Clancy performed his tricks for her, she pointed at him and started muttering with a smile on her face. A nearby caretaker exclaimed that she had not heard this lady make a sound in the weeks that she had been there. We were all thrilled when she began clapping as Clancy showed off more of his tricks. However, your pet doesn’t have to know tricks to help those in need. Any well-behaved, trustworthy, social, sweet, and well-groomed pet that has been conditioned to a variety of distractions will make a good therapy animal. If your dog is able to pass the (AKC) Canine Good Citizen test, your dog would likely be able to pass the temperament screening test that most therapy dog organizations require. “Dr. Clancy” dressed up as a doctor for Halloween, visiting a patient in the hospital. Keeshonden are especially well-suited for therapy work, for they have naturally sweet temperaments and are great family dogs. They have a natural affinity for people and especially children. They are such a happy and social breed that has more tolerance than most for children’s antics and do not seem to mind hugs. Good thing, too, for of course the Keeshond has a huggable factor off the charts… people just can’t resist wrapping their arms around them and burying their head in all that fluff. Kees are also very trainable, making it easy to teach them manners, obedience and tricks. It does take some time from the owner to do the training, but it’s worth it. Mr. Clancy is ready to start today’s lesson at school. From when he was a young puppy and continuing through the present, I brought Clancy everywhere to socialize him with all types of people and to get used to all kinds of environments. We took classes, then enforced manners and practiced obedience in a variety of places such as pet-friendly stores, on sidewalks of store fronts, near playgrounds of screaming children, dog parks (which was the most challenging for us) and unfamiliar places. With some training and patience, you can also train older dogs to be good therapy dogs. Even a couple of keeshonden rescued from puppy mills, who had a very different start to life than Clancy, were socialized and trained and have recently passed their therapy dog screenings (one of them being Reggie, who was one of the lucky ones that was rescued from Marjorie’s Kennel and went on to become a Trick Dog Champion just like Clancy). Kallie (left) and Reggie (right) recently became therapy dogs after being rehabilitated after being rescued from a puppy mill. I didn’t know at the time I got a puppy that I would one day be involved in therapy dog work. Clancy brought me so much joy every day and any time we were out in public, he was a natural with the attention he drew. I couldn’t keep Clancy just to myself when we could use the power of his cuteness, personality and intelligence to make a difference in people’s lives. Clancy took the therapy dog temperament test when he was a little over 2 years old and had completed over 50 different therapy visits to earn his AKC Therapy Dog title shortly before his 4th birthday. Clancy spreading the importance of therapy dog work at an elementary school on Career Day. Clancy and I have so many heart-warming memories of visits that I know made a real difference in that person’s life, already too many to share on a blog post. Many of those visits occurred in Hospice and in the ICU at the hospital. To make someone in those situations smile, to entertain them with something that likely they never have seen before (such as a dog playing the bongos, basketball, or getting a drink out of a cooler), are priceless moments. I even had someone in Hospice profusely thank me because they felt they have now seen everything after seeing Clancy’s performance. Clancy happily listening to a child read during The Paws to Read therapy dog program at a local library. Dog tricks do add to the special memory of having been visited by a therapy dog. A few useful ones for any type of therapy visit is to train your dog “Paws up”, so they may get closer to those that are bed-ridden, “kisses” to get a giggle out of the real animal lovers, “head down” to have your dog lay their head down on people’s laps, and “wave” for those that want to only admire your dog from a distance. If your dog is up for a full out private performance, everyone gets a kick out of uncommon or more complicated tricks. In an upcoming blog post, I will cover dog tricks more in depth. Just be mindful of wearing out your dog and keeping them a safe distance from the spectators when the dog is in motion so to not even risk a scratch. I have Clancy put his paws up on my arm rather than on the patient or on their bed when we’re trying to get him closer to those that have limited mobility. Though you should be covered by the therapy dog organization’s insurance, it’s better to be safe than sorry. Also, know your dog and if you sense that he/she needs a break or indicating any change in behavior, politely end the visit. Clancy lending his fuzzy ears to children brushing up on their reading skills. Therapy pets are high in demand and more volunteers are needed to step up with their capable pets, even if it’s just an hour a month. Pet therapy benefits those in hospitals, therapy, nursing homes, educational programs in schools, children’s reading programs, colleges during stressful exam time, even courtrooms. There are many local pet therapy organizations out there to get you and your pet started in therapy work. Each has their own set of requirements, so check out and compare a few to see what you think will work out best for your situation. To find one, just do a web search for pet therapy organizations in your state. Want to learn more about what therapy dog work is, how it benefits others, and typical requirements or other things to expect? This website has a lot of useful information, www.TherapyDogInfo.net , but always be sure to check with your local therapy dog organizations for specifics. Dogs sense when people really need their companionship… sometimes the best medicine is a warm fuzzy friendly animal to pet. Clancy helped college kids take a mental break from exams at University of Maryland. There’s all kinds of needs for pet therapy volunteers. Now get out there with your pet and make the world a better place! 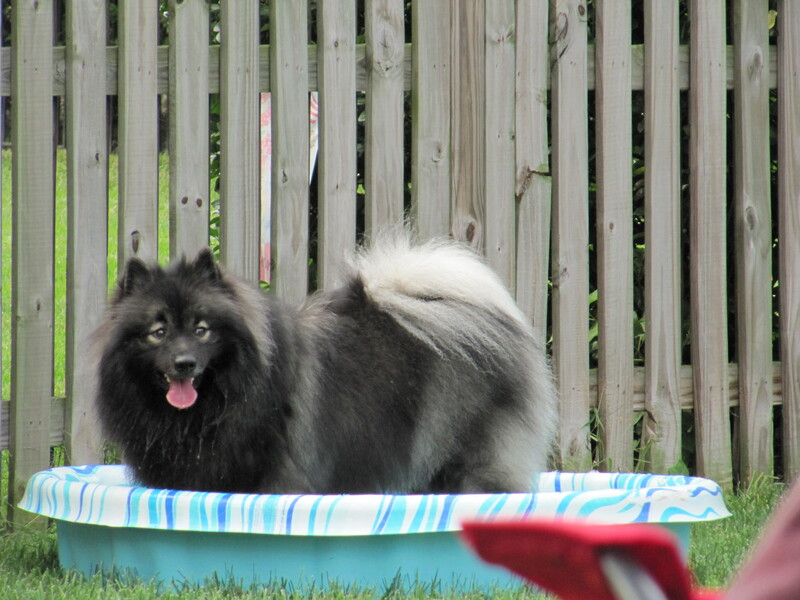 Categories Blog post categories, Clancy ~ My Keeshond, Dog Tricks, Keeshond stuff, Uncategorized, Videos starring Clancy the Keeshond! Today is a day to take at least a moment to reflect upon what you are thankful for, amid the turkey, family and football. Clancy and I would like to thank you for coming to our site! Maybe you’re interested in ideas to enrich your dog’s life, or want to learn more about a specific dog topic, love keeshonden or are a Clancy fan. I am just thankful that you have an interest in understanding that dogs are much more than “just an animal.” I am so thankful to have met so many passionate dog people near and far, both physically and virtually. I am thankful for the support of my dog training friends, am thankful for my local dog breed club, for the therapy dog organization Clancy and I volunteer with, for living in a place where I can do all the things that I do with my dog, for my husband who understands and supports what I do, my family, friends and all my pets, my pet services clients and of course I am thankful to have Clancy in my life… a dog that is so good, sweet, silly, intelligent, social, loving, fun, entertaining, awesome, adorable, patient, understanding, attentive, _insert hundreds of more positive adjectives here_ and is truly my heart and soul dog… I love him so deeply and am thankful for every moment I get to spend with him. P.P.S. Another thing I am grateful for is that Clancy and I achieved our CDX obedience title this past weekend! Stacie and Clancy achieve the Companion Dog Excellent title by earning 3 qualifying scores in Obedience Open. Clancy wishes everyone a Happy and safe HOWLoween!!! Here’s a couple of fun Halloween-oriented pics which offer a preview of the theme of our next couple of blog posts. Paging “Dr. Clancy”… Potty break is over, time to get back to work cheering up patients! Trick FOR A Treat! Clancy will gladly exchange doing a trick for a treat! Hope everyone has a fun and safe Halloween! Remember to keep the chocolate out of reach of the pets. Clancy’s Busy Dog Days of Summer – Winery, Tricks, NYC & more! From the winery to “taking the plunge” in the Chesapeake Bay to being at the library listening to children read books to dock diving to obedience trials to visiting New York City to visiting patients at the hospital to winning a dog trick contest to spending time with beloved family from near and far, Clancy the Keeshond (and I) have had a very busy past couple of months. Check out some “snapshots” of Clancy’s summer below! Then, please remember to check back in a couple of weeks when we share our experiences and encouragement of doing therapy dog work in a new blog post! Clancy through the grape vine! Clancy enjoyed the K9s in the Vines wine tasting animal rescue fundraiser event this late summer. “Bang-Bang!” Clancy won the Dog Trick contest at the K9s in the Vines dog fundraiser event, followed by fellow trick dog friends Aria and Amelia. Clancy in his therapy dog role at the library. He provided a friendly, furry and non-judgmental ear to children helping them with their reading skills. Clancy in the Big Apple! Clancy traveled to New York City for the day. Last month, we tried for our second leg of our CDX Obedience title, but NQ’d (didn’t qualify) due to a failure to drop on recall. That’s okay, we try again this coming weekend and hope to achieve our title the following weekend! Who do you think was the fluffiest dog in the Chesapeake Bay doing the SPCA “Puppy Plunge” fundraiser event held in August? Clancy created many smiles with his trick performances during therapy dog visits and also recently at a child’s birthday party . In August, Clancy qualified for more legs towards his next dock diving title! We look forward to sharing many of these experiences more in detail in future blog posts to hopefully encourage others to seek out and do more activities with their dog. Coming soon: A new blog post to share our experiences and encouragement of doing therapy dog work! We’re also working on a new blog post on dog tricks! 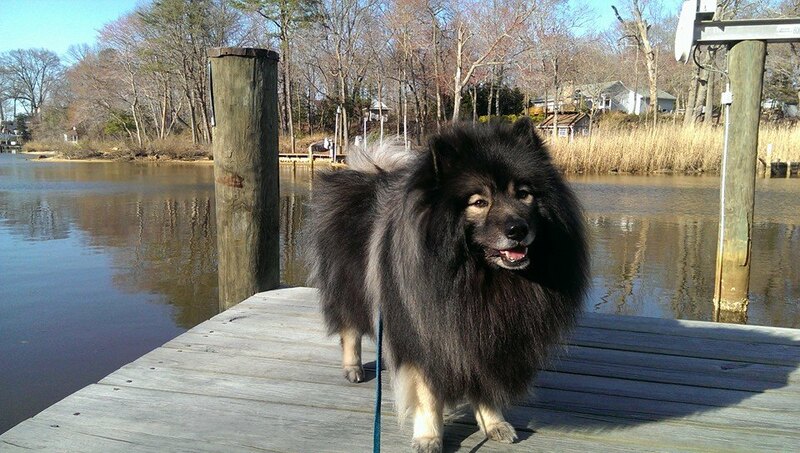 Clancy, the Keeshond, wishes his fellow doggie friends a Happy National Dog Day! From Clancy and family, to you and your fur-baby family… HAPPY NATIONAL DOG DAY! Did anyone do something a little extra special for their furry best friend today? Clancy is looking forward to cooling off in the lake. 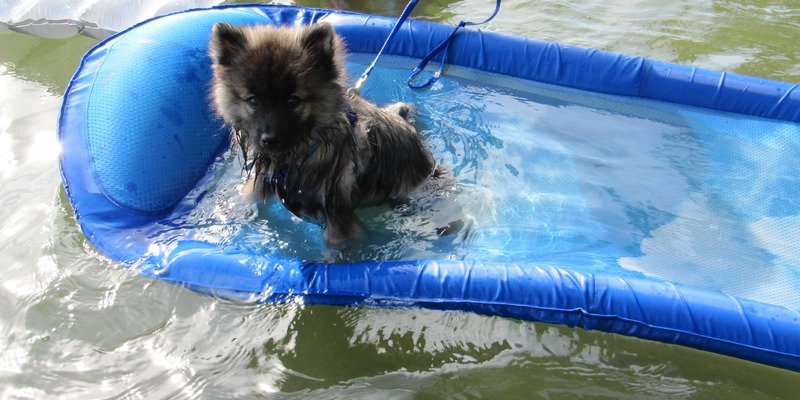 Okay, it’s hot for us 98 degree F blooded humans this time of year… now imagine being a 101 degree F blooded canine and having a fur coat… and if you’re a Keeshond, having a double fur coat on! For many dogs, including the Kees, it’s not a favorite time of year (nor mine… I much prefer the cold over the heat.) Clancy hardly even wants to go outside to do his business… Funny how many times he barks to go out when it’s below 60 degrees outside and how little he seems to need to relieve himself when it’s above 85 degrees out. A dog shouldn’t be cooped up inside all summer long though… (and they certainly shouldn’t live their lives outdoors either!) There are some things you can do to make life more enjoyable for your furry friend during these dog days of summer and have a little fun together. Clancy is always first in the water. 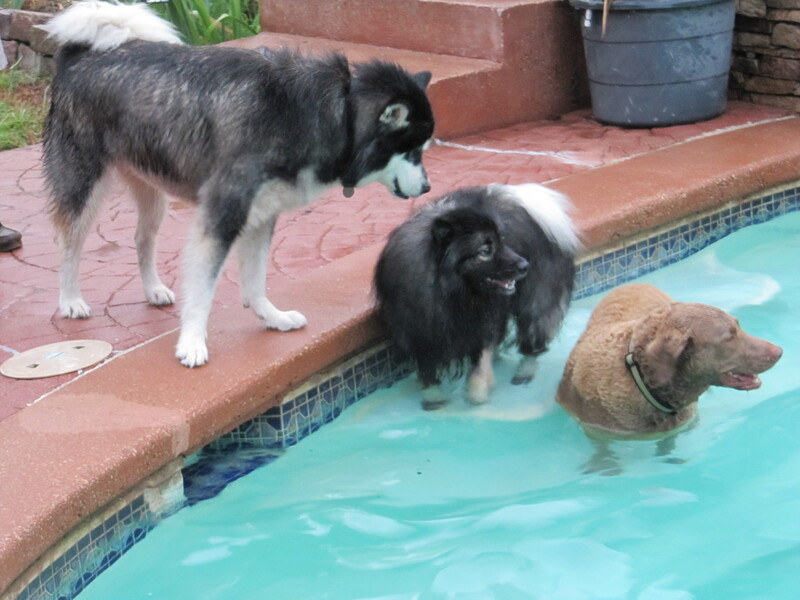 Clancy entices a Keesie friend to jump in to cool off, too! Fill a baby pool up in the backyard and go splashing around with your pup. 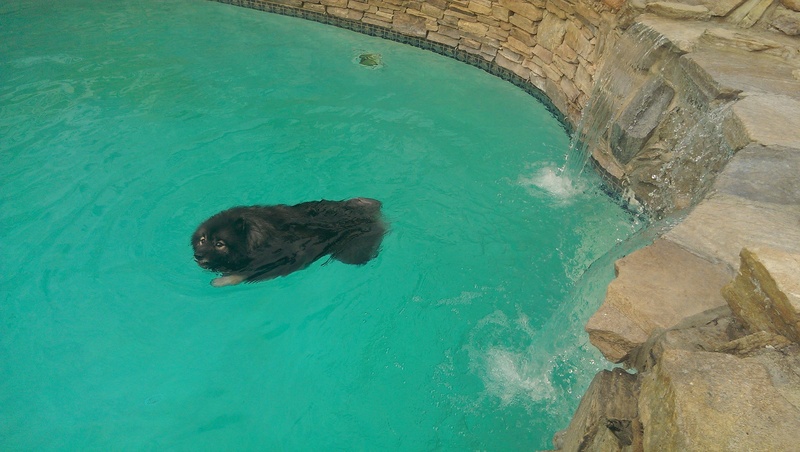 C’mon, make-believe that you’re 5 years old again and sit in the center of the pool… pat the water and encourage your dog to hop in. If they’re hesitant or don’t seem to like water, start off with an empty pool and let them get used to it. Make it a game to hop in and out of the empty pool. Eventually add just a little bit of water and gradually work your way to a full pool. Make up fun games such as bobbing for hot dog pieces. Be sure to empty it when you’re through and not leave a breeding ground for mosquitoes. Don’t have a baby pool? How about just laying out a tarp and have a running hose on it for your dog to roll around or a soaked towel just to stand on? Dogs sweat through the pads of their feet so it feels good for them to stand in/on something cool. I know Clancy is hot when he digs in the water dish splashing water all around… then he just stands in it. Clancy in a dock diving competition. 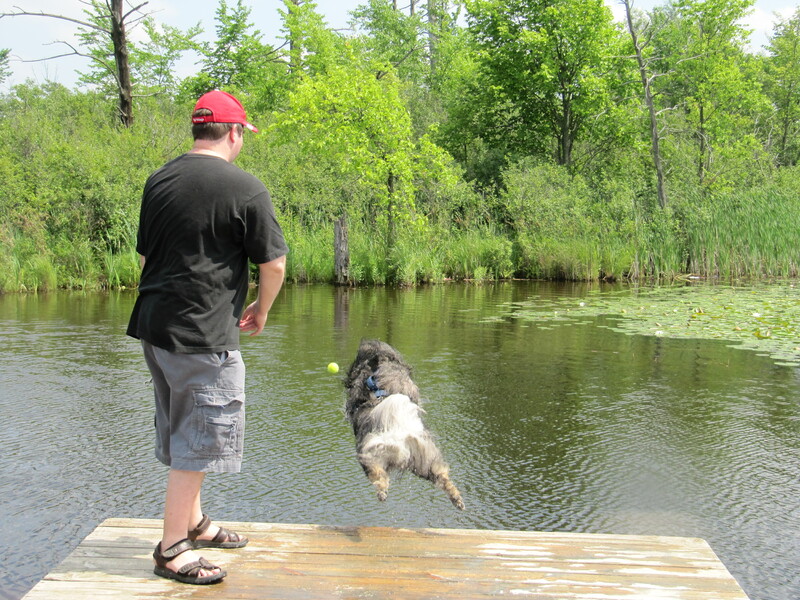 Our fun summer dog sport is dock diving (many of you know this already)! As I mentioned in a previous post on dock diving (I hope to add a second post about the topic in the near future), practically ANY dog can learn how to participate. Clancy loves jumping off docks for fun! Try it yourself at the amazing 24 acre Orion Oaks Dog Park in Lake Orion, Michigan, which offers a large dock with ramps into a lake for the dogs. There’s even a new offering of various water sports games for your dog. Many dock diving facilities offer lessons and it’s a great way to have summer fun with your dog. If there is a dock diving competition happening near you, they usually allow you to give it a try during their practice hours. Usually mornings and Sundays have less competitors trying to practice, so you may end up getting extra pool time. Of course all you really need is a body of water and a dock. 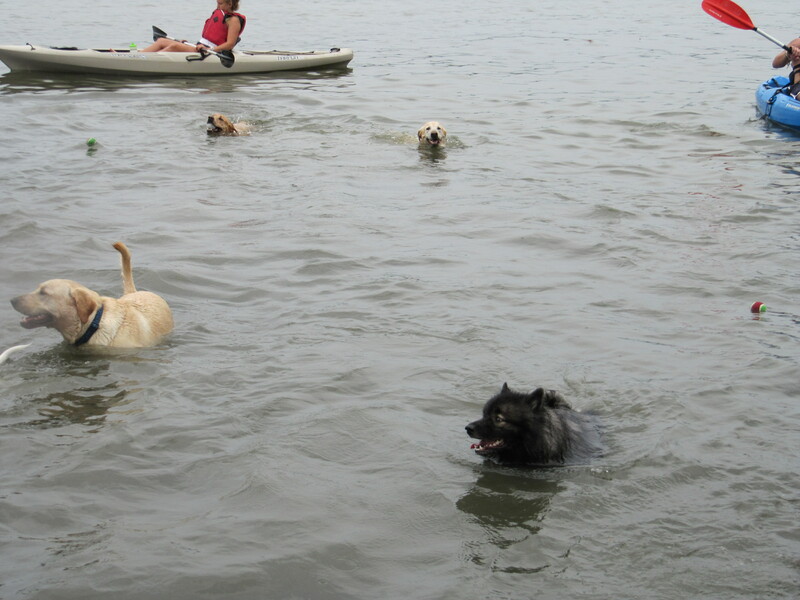 Look for fun dog water activities in your area or just enjoy a game of fetch at a dog friendly pool or the beach. 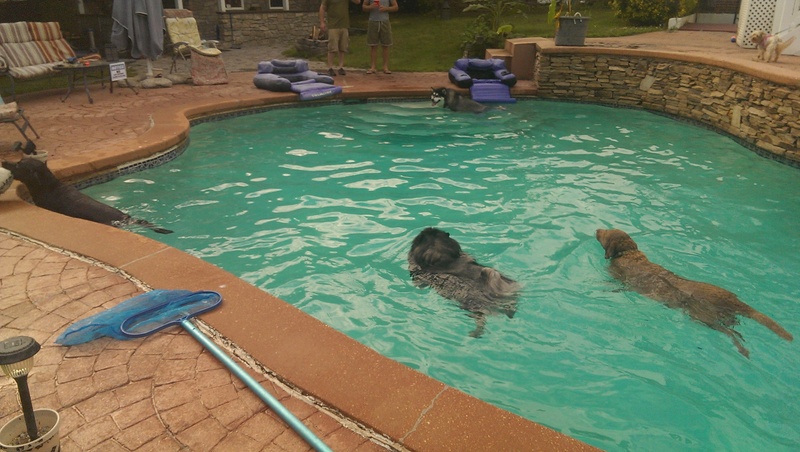 Clancy cooling off with other dogs at a pet fundraiser. There are often fun dog events and fundraisers that non-profit organizations or clubs put on throughout the summer. 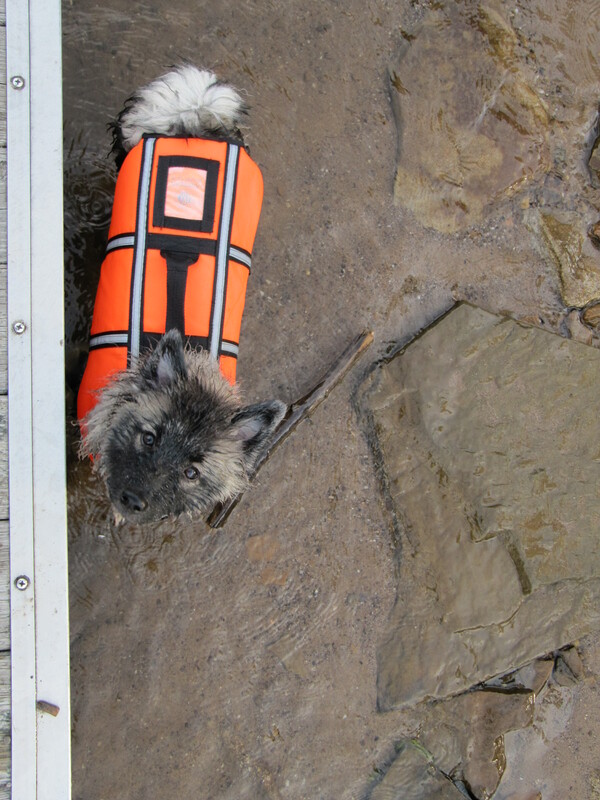 For example, Clancy looks forward to the SPCA Puppy Plunge each August, a fun and wet dog fundraiser event at a local YMCA summer camp on the river. Below is a video of Clancy enjoying the event last year where we helped to raise over $200 in pledges for that local SPCA. at many local community pools and waterparks on their final days before closing for the season. Clancy enjoying the dog days of summer in style. Be sure to rinse out the chlorine or river water off of your dog when you’re finished. Little puppy Clancy keeping cool at his first hockey game. 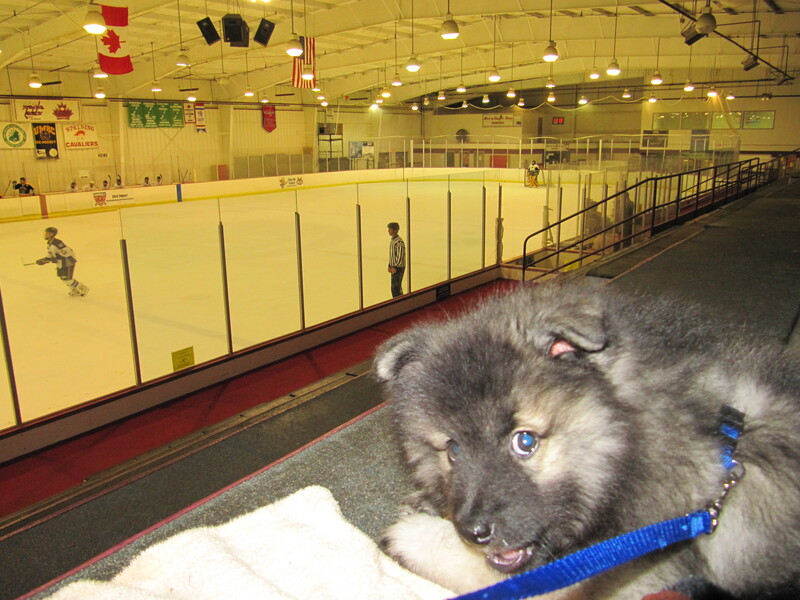 Take your dog to a summer ice hockey game at the local ice rink (if allowed.) 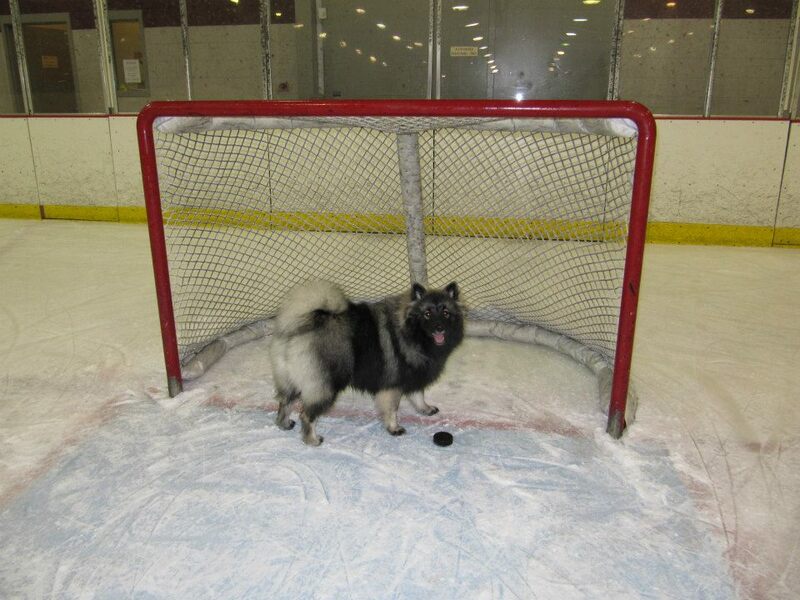 Often there are recreational late night games and many ice rinks don’t mind you bringing your well-behaved dog in with you to watch the game. Dogs will likely enjoy climbing the mountains of snow the Zamboni dumps behind the building, too. Young Clancy trying to be like his goalie “dad”. Clancy became the “unofficial mascot” for my husband’s hockey team since he never missed a chance tagging along to the cool confines of the ice rink. Provide some fun doggie frozen treats. Ice cubes are one of Clancy’s favorite summertime treat and there are many recipes online to make them really interesting and tasty. Physically and mentally exercise your dog inside in the air conditioning. Teach your dog a new trick or build on manners and obedience skills by requiring them to wait longer to be released, etc. Use interactive toys, a treat dispensing toy, puzzle toys, drag toys on a rope or use a laser to get them moving. Buy a dog treadmill. You can sometimes find a deal on Craigslist. Clancy walks on his treadmill indoors in the AC and with a fan blowing on him. He definitely prefers this over taking walks in the 90+ degree summer heat. Watch the video below of Clancy and his treadmill tips. Be sure to bring plenty of cool water for your dog when you are spending time outside in hot weather and offer it to your dog often. 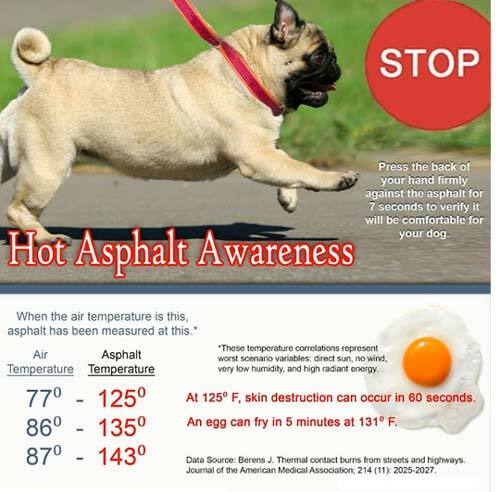 Be aware of the pavement temperatures… if it is too hot for your bare feet, it’s too hot on your dog’s feet, too! Walk them early in the morning, choose the shady side of the street, walk them in the grass, carry them over hot asphalt if possible or have them wear doggie booties if they will be walking on hot pavement. NEVER leave your dog in a car, even with the windows open. Try sitting in a car on a summer day with the windows just cracked and see how long you last before you can’t take it anymore… it’s literally just seconds. Provide shade with a canopy, umbrella, or something that your dog can use to get out of the sun when you’re at a picnic or other event. Dogs can get sunburnt too, not to mention how much hotter it is to be in the sun versus the shade. Bring a couple of powerful battery operated fans to blow on your dog. Clancy keeping cool by being wet, laying in a ventilated beach tent with a portable fan and his water. You may want to try cooling mats/beds and or cooling jackets. I personally haven’t had success with these on my Keeshond, but they may be good for other dogs. Know the signs of heat stress. Clancy, like all Kees, have a beautiful double coat. 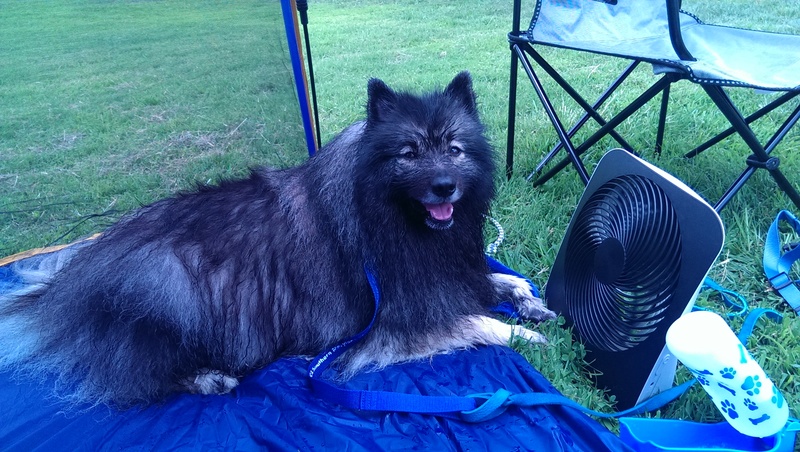 When it’s hot, should you shave a Keeshond? No. No. No. Use the tips in this blog post to make your dog comfortable. Keep your dog properly groomed, especially if it is a double-coated breed, such as the Keeshond. Line-brushing your Kees to ensure the fur is combed through all the way to the skin will allow air to circulate keeping your Kees comfortable. Please see my comments below about shaving Keeshonden. 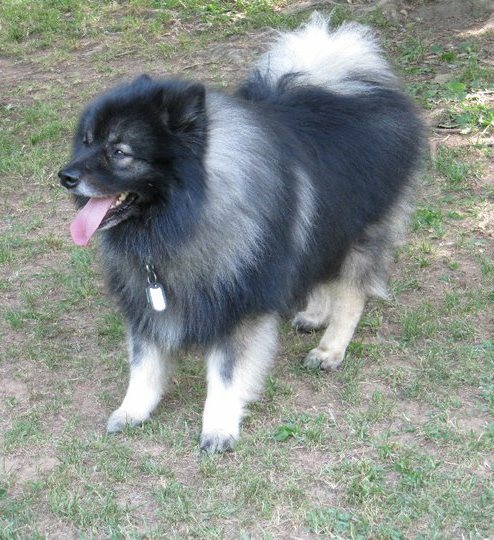 Finally, I know this may be a controversial subject for some, but as much as you think you are doing a favor by shaving them, please do not shave your double-coated breed, particularly the Keeshond. During the summer, the 2nd most common question I’m asked when I’m out with Clancy (first most common is always “What kind of dog IS that? !”) is “aren’t you going to shave him?” Well, I’m sure the inquirer is expecting a yes or no answer, most likely a yes answer. However, I feel I have to accompany an explanation with my answer of “no”. Clancy prefers the air conditioning vent over his bed during the summer… the cat is happy about that! I explain how the double coat insulates him from the cold AND the heat, how fair their skin is and how easily they would get sun-burnt and their coat would not grow back the same way it’s meant to be. Just brush your Kees a little more regularly during the hot months to encourage air flow and your Kees will be fine, especially with the tips I listed above. This has always been Clancy’s favorite way to cool down. What’s your dog’s fave way to beat the heat? Please feel free to share your own suggestions on having fun with your dog when it’s hot and enjoy the rest of summer with your pup! 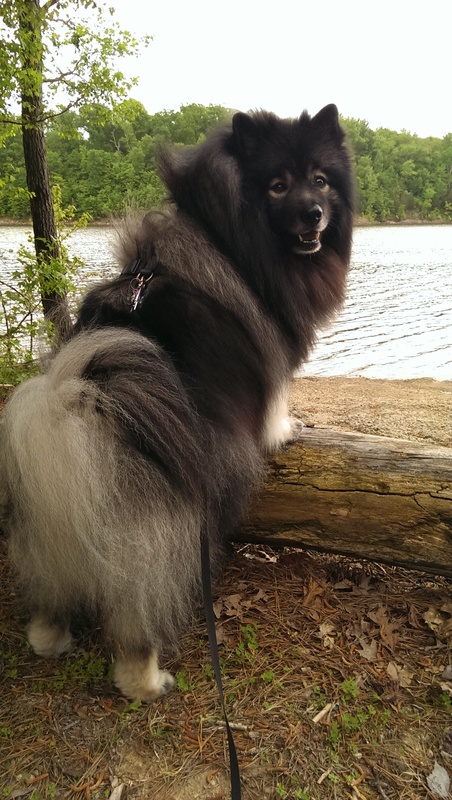 Categories Clancy ~ My Keeshond, Pet advice, Videos starring Clancy the Keeshond! Today is Bring Your Dog to Work Day! Friday, June 26, 2015! In honor of today being “Bring Your Dog To Work Day”, I am reposting my blog from last year on the topic. Though my office building will no longer allow dogs to come in (my company does, but the big office building we’re in doesn’t), I did get to “bring my dog to work” yesterday during my dog walking appointment for my pet services business. I do have a picture of my dog with me though and I encourage all dog owners to remember to ask next year if they could participate in National Bring Your Dog to Work Day! If not, at least bring a picture of your furbaby to work to show off. Just looking at a picture and talking about your dog offers many therapeutic results. Enjoy! Bring Your Dog to Work Day! Friday, June 20th. Happy Father’s Day to Doggie Dads and all the Great Fathers out there! Happy Father’s Day to all the great dads out there! May you be a dad of a human or a dad of a furbaby, we hope you know we appreciate the work and love you put into raising and continuing to care for them. Clancy and I thought we would share a few pictures of Clancy’s dad on this Father’s Day. Hugs to you, Kyler! Thank you for passing on your fun, goofy and sweet temperament to Clancy and of course your good looks, too! Clancy ended up looking a lot like his dad, “Kyler” (pictured here), which is exactly what I was hoping for. Please remember when you’re thinking about adding a puppy to your family, that you make sure you find out who the father is, where he’s at, see if you could visit or at least see a picture of him, get a copy of his pedigree and copies of his health certifications. Please read the advice I shared recently on what to ask breeders if you are looking for a pure-bred puppy here. 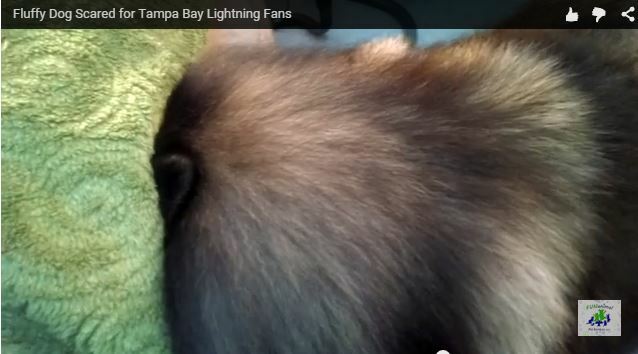 As Clancy and I watch Game 6 of the NHL Stanley Cup Finals (we’re big hockey fans), here’s a quick, funny and cute dog trick video poking fun at the Tampa Bay Lightning fans. This is another fluffy dog tricks video dedicated to bringing attention to rescuing the Keeshonden in Marjorie’s Puppy Mill in Harpursville, New York. Please learn more at www.KeesRescue.com. For each milestone met on the #FreeTheKees petition, we post another dog trick video! P.S. Our favorite teams aren’t involved… but we do respect the Bolts and the Chicago Blackhawks! 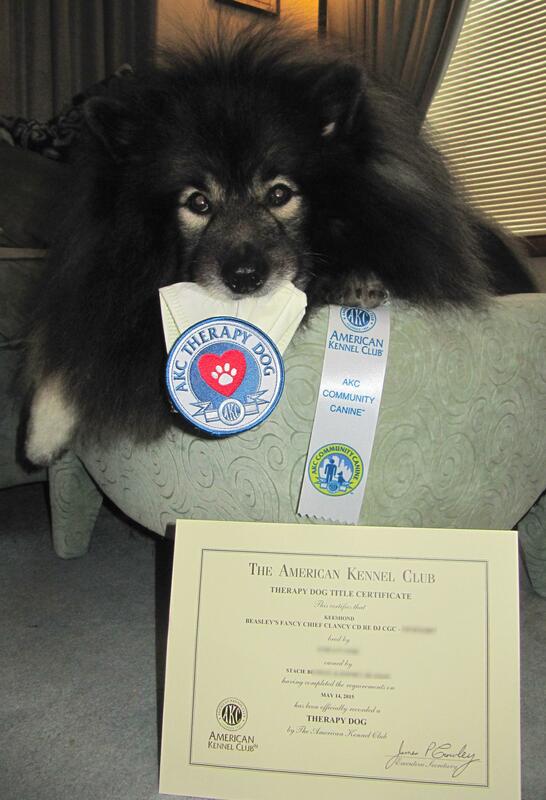 Categories Clancy ~ My Keeshond, Dog Tricks, Videos starring Clancy the Keeshond! Tomorrow (Saturday) is the Keeshond Karnival and Symposium hosted by the Keeshond Club of Delaware Valley and as our last dog trick video leading up to it, I’m going to share one of Clancy and I’s first stage acts at a dog talent show from last year. Clancy wins 1st place at the 2014 Maryland DogFest talent show… he also won it in 2013 and for the third strait time in 2015! Sorry for the late post! Been a busy day with work and family stuff! Yesterday you saw the video of Clancy going to get his leash and harness so he could go for a walk, today you get to see him “take a doggie for a walk”. These dog trick videos are dedicated to helping to bring attention to #FreeTheKees, telling New York to strengthen and enforce their puppy mill laws so that over 50 Keeshonden being neglected at Marjorie’s Kennel in Harpursville, NY will have a chance to be rescued like the 51 of them that already have been who are now living a quality life in the hands of caring people. Clancy’s “Dog Trick of the Day” has also been to promote the Keeshond Karnival and Symposium that will be held this Saturday! Enjoy! 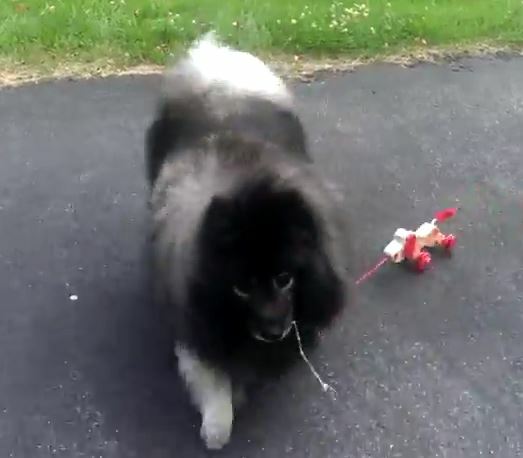 There’s not many things cuter than a Keeshond walking a toy dog! Come see him do it in person this Saturday! Clancy taking a child’s toy dog for a walk! 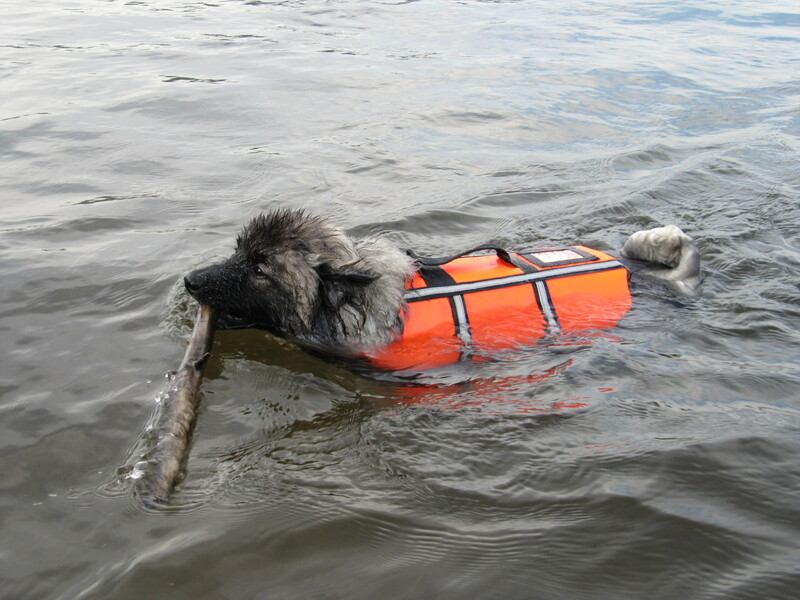 We’re only a few days away from the Keeshond Karnival and Symposium at the Washington Crossing State Park in Titusville, New Jersey and today’s Dog Trick video of the Day is Clancy doing a useful trick in order to just go out and do a common dog thing. Please watch his video below. P.S. Sorry that the video isn’t the best quality, I’m still suffering technical difficulties and am resorting to using my cell phone to record new videos. Clancy does do normal dog activities like going for a walk too! He just gets his own leash and harness for you! 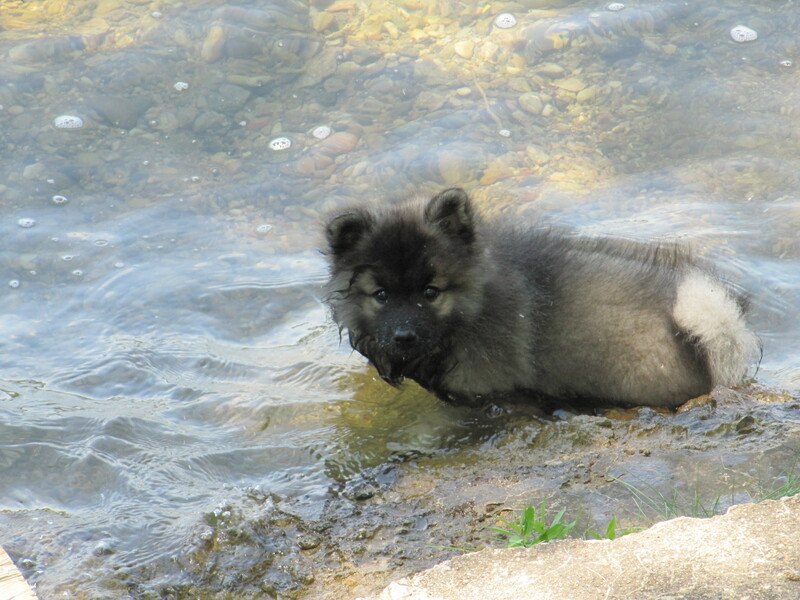 Categories Clancy ~ My Keeshond, Dog Tricks, Keeshond stuff, Pet advice, Videos starring Clancy the Keeshond! I am posting a new trick video each day of the week leading up to the Keeshond Karnival and Symposium this Saturday. Friday was “Keyboard Clancy”, Saturday was “Clancy delivers beer from cooler and recycles” , Sunday was “Clancy basketball” , and Monday was “Clancy honks horn” . I have a new dog trick video that I’ve been trying to post for the last couple of hours, but unfortunately I’m experiencing technical difficulties with the Internet and YouTube. 😦 I will try again tomorrow. 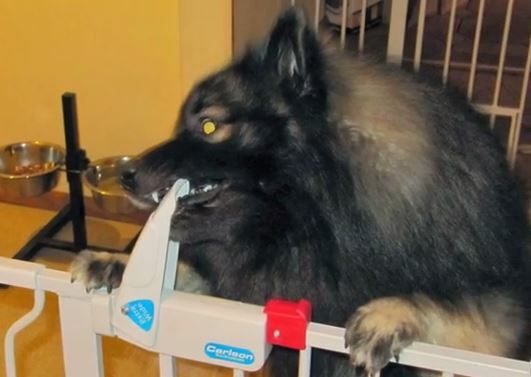 In the meantime, I have to improvise with today’s trick video, so please enjoy a unique trick Clancy taught himself very quickly… opening up a locked child gate! Hope to see many of you on Saturday! 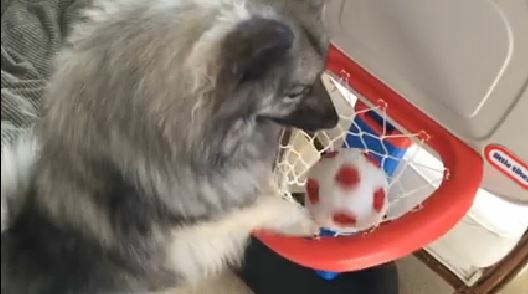 Fluffy Dog Basketball Dog Trick – 6 days til Keeshond fun! One of Clancy’s most favorite tricks is playing basketball. This one always gets a great reaction on our therapy dog visits and stage acts. It’s Saturday night! Let Clancy bring you a beer! 1 week til the Keesie fun! The Fluffy Dog Beer delivery service now serves from coolers! Let Clancy bring you a beer and properly discard of your empties on this Saturday night! We’re celebrating that we have a Triple Crown winning horse (Congrats American Pharoah!) 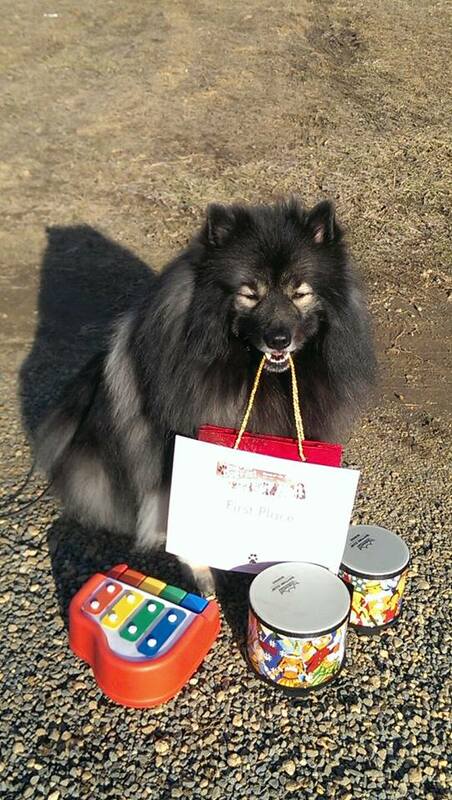 for the first time in 37 years and we’re just one week away from the Keeshond Karnival and Symposium. (See my prior post for details.) As promised, I will post a video of Clancy doing a fun dog trick each day leading up to his trick show at the Kees event on Saturday, June 13th. Each of these videos are also dedicated to the effort to bring attention to the 60 or so remaining Keeshonden that are being neglected at Marjorie’s Kennel, one of the worst puppy mills in the United States. Please learn more and how you can help at www.KeesRescue.com. Come back tomorrow for another dog trick video! 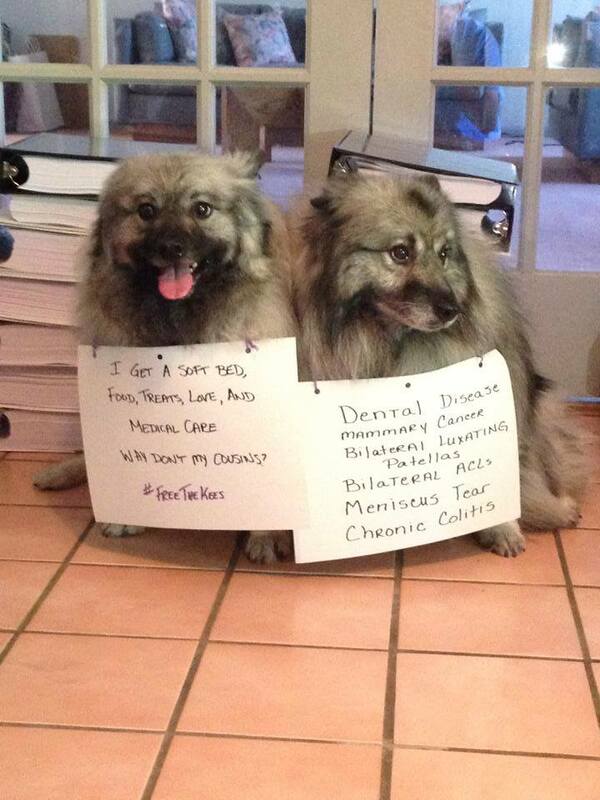 #FreeTheKees, Keeshond Symposium, Dog Tricks, More Titles, etc. 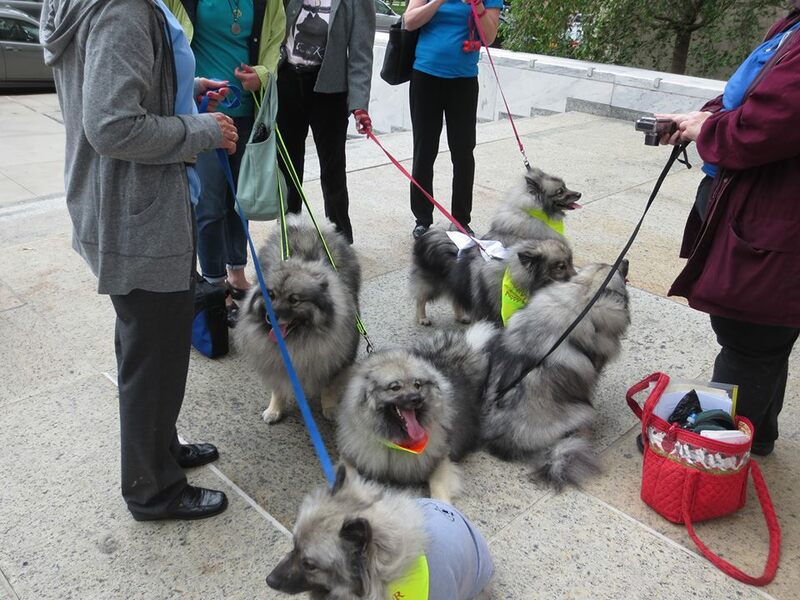 next weekend there will be a fun and educational Keeshond event on the East Coast for anyone who has a Kees or is interested in a Kees — click here for more information: Keeshond Symposium June 13, 2015, Clancy will be performing a dog trick show there! Since the last time I blogged, Clancy has many more dog tricks up his furry sleeves, we’ve achieved our first leg of our CDX obedience title and our 4th leg of our RAE Rally title. More importantly, Clancy passed the Advanced Canine Good Citizen test and has earned his CGCA (Community Canine) title and recently accomplished over 50 therapy dog visits which earned him his AKC Therapy Dog (THD) title. 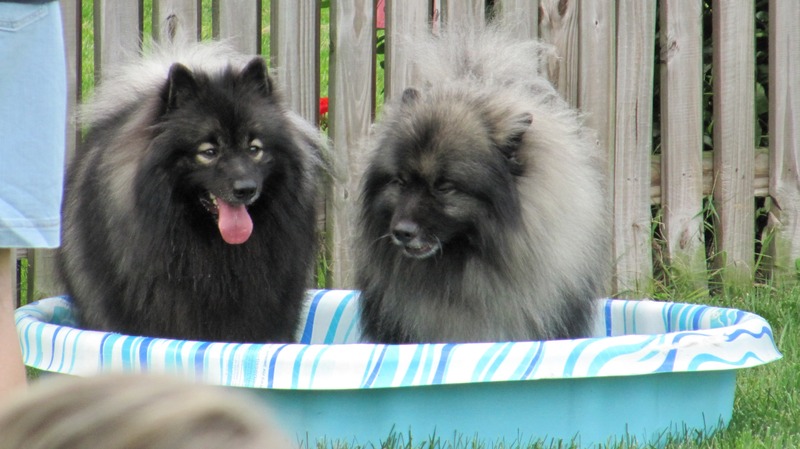 Clancy also became the first Keeshond to compete in the Ultimate Air Dogs “Chase It” swimming races and holds the Keeshond fastest swimmer brag. There’s probably more things that I’m forgetting, but I’ve been handicapped with my laptop being broken that has all my pictures, videos and software on it. It’s also the busy season for both jobs that I work, so I apologize that it’s been the longest gap in between blog posts ever for me. 😦 2015 is half over and I still have the winter theme up on my blog! Ahhh! Well, I will do what I can when I can here… I have trick videos I want to add here (just need to get my laptop up and running again), stories about the #FreeTheKees Keeshond Rescue effort, and what I really have intended to do with my blog from the beginning, writing articles about the experiences I have with my dog, Clancy, to encourage others to make efforts to further enrich the lives of their own dogs. Learn more at www.KeesRescue.com and use hashtag #FreeTheKees in Twitter, Facebook, etc. Thanks! Categories Clancy ~ My Keeshond, Keeshond stuff, Uncategorized, Videos starring Clancy the Keeshond! Wowzers! 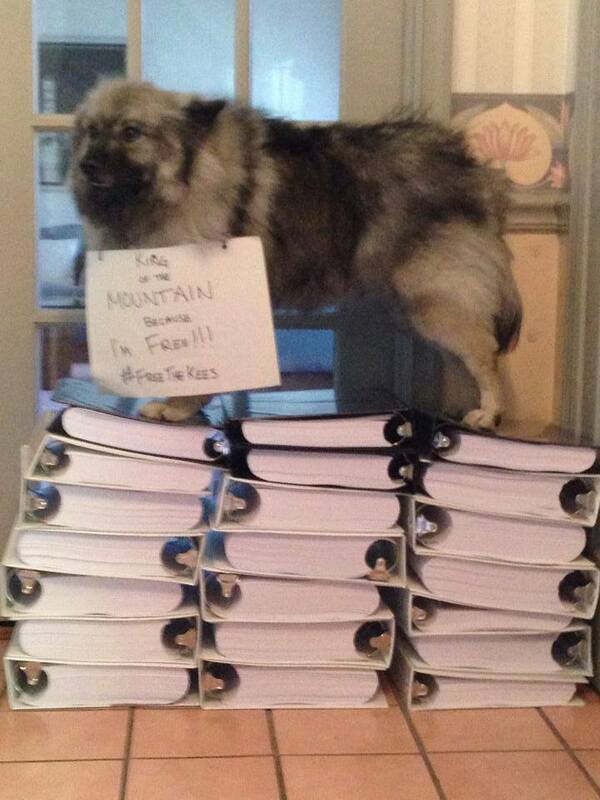 We are suddenly closing in on 150,000 signatures on the #FreeTheKees petition at www.KeesRescue.com and my Keeshond, Clancy, and I are thrilled that the cause so near and dear to our heart is finally getting the attention it deserves! Originally, I said I would post a video of Clancy doing a dog trick for every 5000 signatures on the petition telling New York Governor Cuomo and the New York State Department of Agriculture to enforce their own puppy mill laws. Specifically to enforce Charlemagne’s Law, which Marjorie’s Kennel, a puppy mill of Keeshonden and a couple of other northern breeds in Harpursville, NY, is clearly violating. I recently had to change it to every milestone met on the petition because I couldn’t keep up with all of the wonderful people that believe Marjorie’s dogs should have a better life than just being breeding machines while trying to survive outside in the New York sub-zero winter temperatures. So here’s a new short video demonstrating many of the dog tricks and things that Clancy can do. It’s a compilation of many parts of trick videos we’ve already produced (with a new “play and stay dead”). I’m submitting demo videos to animal talent agents so I thought I would share them to help begin fulfilling my promise of Clancy’s tricks for petition signatures. This is demo video #1. 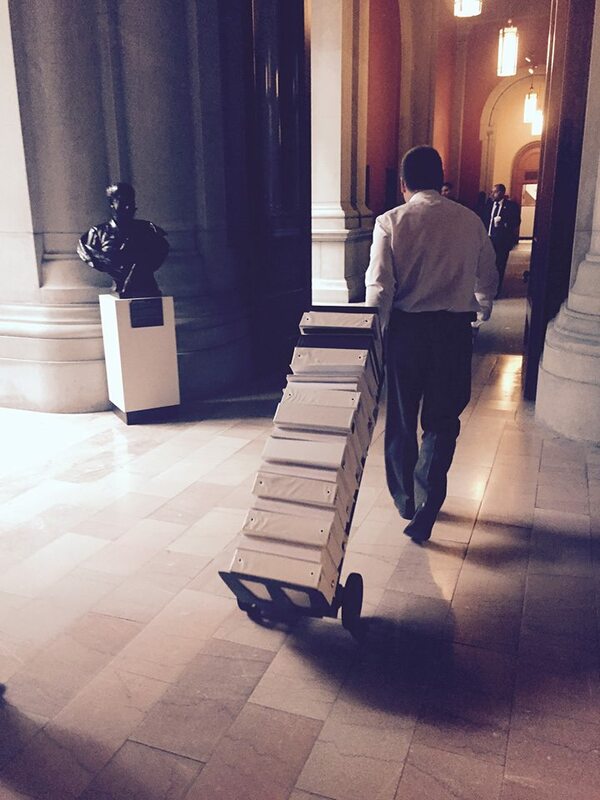 Clancy and I have a lot of work to do. It might take some time since I still have to earn a living, but we will be happy to be in debt to you all for HUNDREDS of trick videos as long as everyone keeps the pressure on New York and Marjorie to #FreeTheKees. Let all those dogs become the wonderful pets they were meant to be. Learn more at www.KeesRescue.com. Like the Free The Kees Facebook page to learn of other ways to help, too! A New York 101 Kees, “Reggie”, playing basketball. Clancy and I would like to give a big WOOF out to Mary Lynch and “Reggie”. 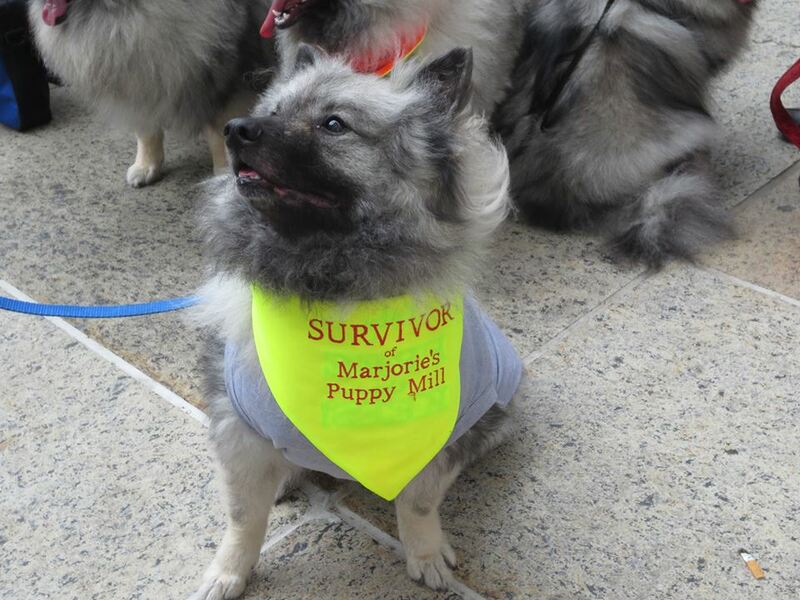 “Reggie” is one of the Keeshonden rescued from Marjorie’s Puppy Mill and has already become an Expert Trick Dog (and Mary is working with him to become the next Keeshond Trick Dog Champion). Congrats, Mary and “Reggie”… and to all the wonderful people that have rehabilitated the dogs that have been rescued from Marjorie’s Puppy Mill so far! This just proves that every dog is capable of so much. One of the many reasons why we need to just put a stop to puppy mills. 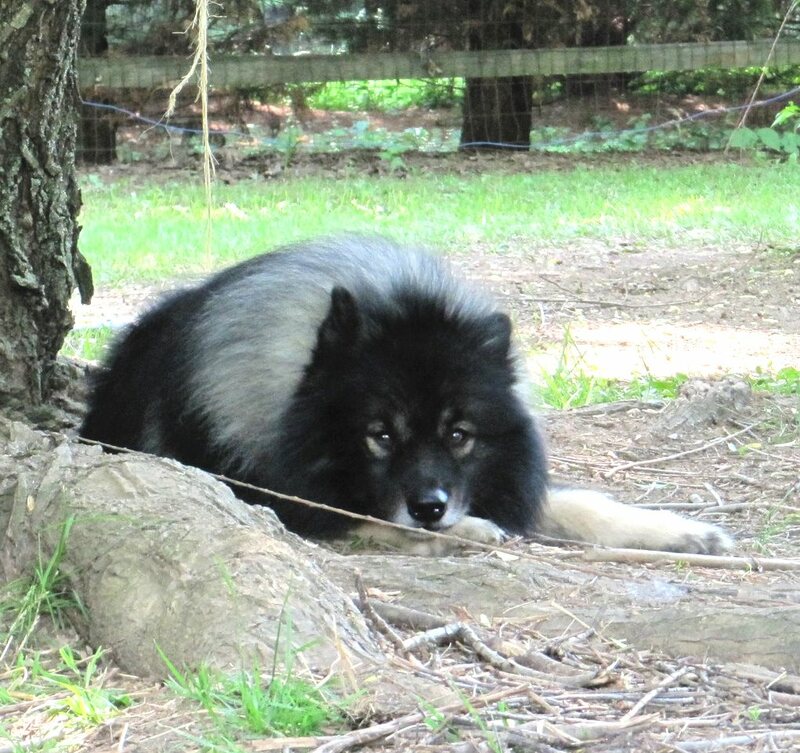 Categories Clancy ~ My Keeshond, Dog Tricks, Keeshond stuff, Uncategorized, Videos starring Clancy the Keeshond! After we achieve this, we will refocus on dog tricks. Of course, dog obedience will be a topic of a future blog post as well, since it’s a great way to enhance you and your dog’s life! Wish us luck and touch base with you soon! 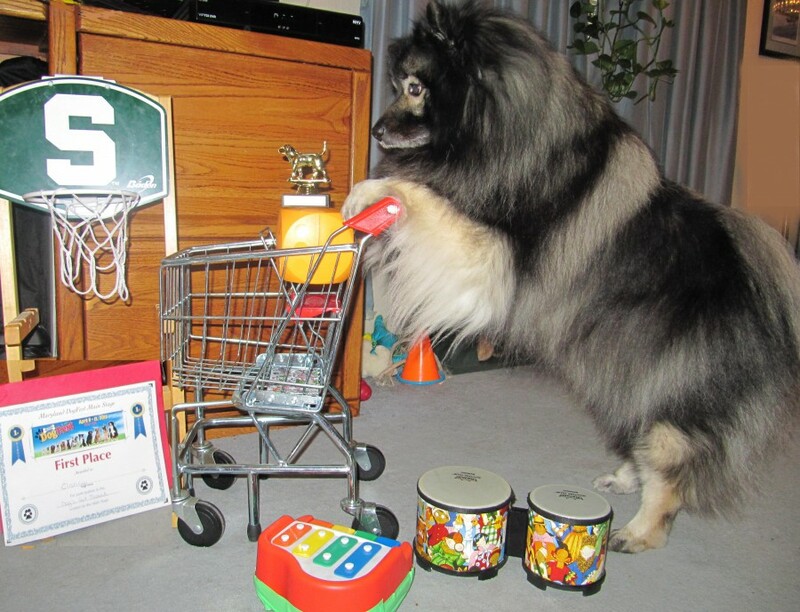 Categories Clancy ~ My Keeshond, Dog Sports, Videos starring Clancy the Keeshond! A young spectator at Clancy’s dog trick show at a children’s birthday party takes his “playing dead” trick too seriously. 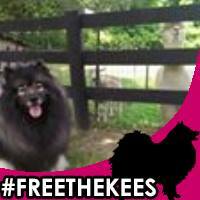 Remember to please keep spreading the word to #FreeTheKees being neglected in Marjorie’s Kennel in Harpursville, NY. Visit http://www.KeesRescue.com for more information. Thank you!